Learn about green death care options from the region’s leading natural burial providers. Be the first to learn about “Aqua Green Cremation,” now available in the Portland area. 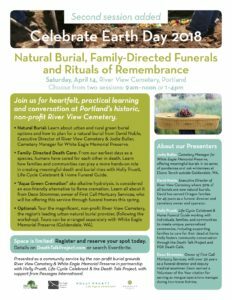 Natural Burial: Learn about urban and rural green burial options and how to plan for a natural burial from David Noble, Executive Director of River View Cemetery & Jodie Buller, Cemetery Manager for White Eagle Memorial Preserve. Family-Directed Death Care: From our earliest days as a species, humans have cared for each other in death. Learn how families and communities can play a more hands-on role in creating meaningful death and burial rites with Holly Pruett, Life-Cycle Celebrant & Home Funeral Guide. “Aqua Green Cremation” aka alkaline hydrolysis, is considered an eco-friendly alternative to flame cremation. Learn all about it from Deon Strommer, owner of First Call Mortuary Services, who will be offering this service through funeral homes this spring. Optional: Tour River View Cemetery, the region’s leading urban natural burial provider, the magnificent, historic, non-profit (following the workshop). Tours can be arranged separately with White Eagle Memorial Preserve (Goldendale, WA), click here to contact. David Noble, Executive Director of River View Cemetery ~ David Noble has been serving Oregon families for 45 years as a funeral director, embalmer, cemetery owner, and currently, as Executive Director of River View Cemetery in Portland. Eight years ago, River View began offering the option of burial without embalming, without an outer burial container, or even without a casket, throughout the entire cemetery. Natural burial now constitutes 30% of River View’s burials. David is an avid supporter of green burials, as well as home funerals, and has made presentations on the merits of green burial at numerous national and local conventions of funeral directors and cemetery owners/operators. Holly Pruett, Life-Cycle Celebrant & Home Funeral Guide ~ A Life-Cycle Celebrant and Home Funeral Guide, Holly works with individuals, families, and communities to create unique, personalized ceremonies from cradle to grave, including supporting families to care for their dead at home. As a community conversation leader, Holly is the founder of the Death Talk Project, has organized PDX Death Café (the largest in the world) since 2013, and was the driving force behind the 500-person conference Death:OK (Let’s Talk About It). Deon Strommer, Owner of First Call Mortuary Services ~ Deon has worked in death care since 1984 as a funeral director, embalmer, and deputy medical examiner. He works on national and regional disaster response teams and was the morgue operations manager during Hurricane Katrina for 7 months, earning a Volunteer of the Year citation. He looks forward to opening the first alkaline hydrolysis facility in the Portland metro area, making this eco-friendly option available through participating funeral homes.